As a member of last year’s team, I can tell you that it did not change my life, but what it did do was to give me the tools and the confidence to change my own life. Almost exactly one year ago I sent in my submission during a cold night in Afton, Minnesota, when I was at an emotional low point in my life. Just making the video and sending it in was the start of new positivity for me, and it was positivity that became my mantra for the incredible year that I experienced. My life is continuing to go through some big changes, but the changes don’t rattle me. I just breathe and keep peddling. The triathlon events of swim, bike, and run are so much more than activities. It’s hard to describe, but they will become what you make of them. For me, the swim meant getting back to something that I loved and that I needed; the many, many days in the pool or in the lakes this past year were my best days. 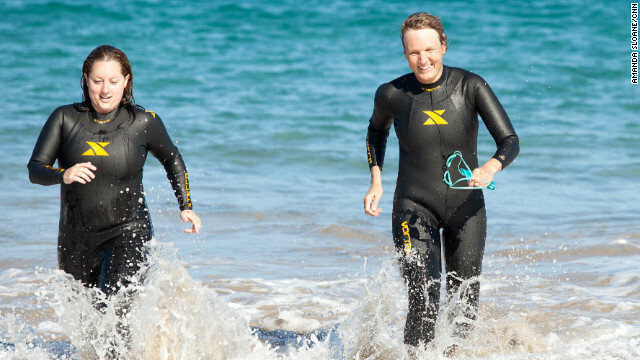 During the Nautica Malibu Triathlon, conquering the Pacific was exhilarating. The bike was about letting go and just being in the present with nature. Biking the beautiful rolling countryside near my home brought me peace and perspective. Running for me was hard, but the challenge made me work and focus. It wasn’t until I competed in some local races before the triathlon that I was really able to gauge my improvement. I still can’t believe that I actually competed in two 10-mile races in the weeks after the triathlon. The running really gave me a can-do attitude. The most impactful part of the past year was the newfound friendships. There is not a single day that goes by when I don’t think of each one of my teammates and coaches and smile. We will always share a common bond and they will forever hold a special place in my thoughts. Then there’s that Sanjay Gupta guy. Yes, he is a brilliant neurosurgeon, the CNN chief medical correspondent, has traveled the world, and knows everything about everything, but he is also one the kindest, nicest, and most down-to-earth people you could ever meet. He and the rest of the CNN team are one of a kind, special people. So, go ahead and send in your video. Don’t worry about details or making it flashy, just speak from the heart and see where it takes you.